Preheat oven to 190C or 170C fan. Place pumpkin, bacon, garlic and half of oil in a baking pan and toss to coat. Cook for 30-40 minutes, until pumpkin is tender. Squeeze garlic from skin. Meanwhile cook pasta in a large saucepan of boiling, salted water according to packet directions. Drain, preserving 1 cup of cooking liquid. 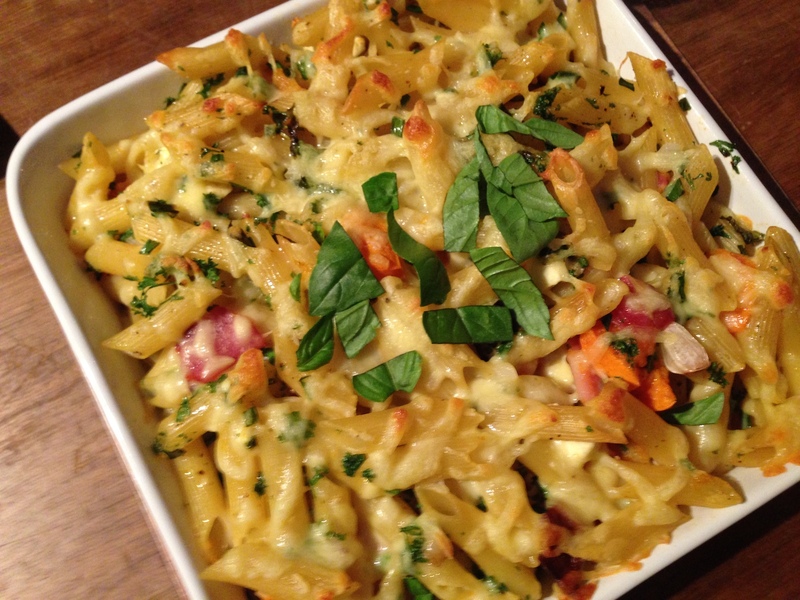 Combine pasta, pumpkin, bacon, garlic flesh, feta, parsley and basil plus remaining oil in a 10 cup ovenproof dish. (Do you ever know how many cups your dish is? I wouldn’t have clue, so just choose whatever looks to be the right size). At this stage I also sprinkle through just a tad of dried mixed herbs. Pour over reserved liquid and top with mozzarella. Bake for 25 minutes, until golden. When serving use some basil sprigs for garnish. A definite dish to repeat in the winter. It will be one of our weekend standbys. Hope you like it too. Thank you misterk3, we have about 4 more months of winter so no doubt a lot more pumpkin to be consumed!